Disfrute de una villa de lujo de 2 dormitorios en The Westin Lagunamar Ocean Resort Villas & Spa en Cancún, México. La villa de 2 dormitorios tiene un dormitorio principal con una cama King Size con un baño grande que incluye dos lavabos, una ducha a ras de suelo y una bañera de hidromasaje. El segundo dormitorio tiene una cama queen size. Ambas habitaciones tienen TV de pantalla plana s. La sala de estar tiene un sofá cama, un televisor de pantalla plana, un reproductor de DVD y una radio Bose Wave. La villa tiene una cocina totalmente equipada que incluye una placa de cocina de cuatro quemadores, horno de microondas, refrigerador grande con máquina de hielo, lavavajillas, cafetera, tostadora, licuadora y vajilla, un área de comedor, lavadora y secadora, un balcón privado con terraza al aire libre Muebles, caja de seguridad e Internet inalámbrico de alta velocidad (incluido). Servicio de limpieza va a limpiar la casa una vez a mitad de semana durante las estancias semanales. We are a family of 2 grandparents, 2 parents and a 4 and 7 year old. This property was absolutely perfect with lots of shared family space and enough private space. The condo is lovely, well cared for and has everything we needed. We especially enjoyed having the 2 balconies. We used and enjoyed the community BBQ area often.....there are BBQ tools included. The grounds and pools are beautiful. The staff throughout are friendly and helpful. There is so much to do in the area that we will definitely be back again. I traveled Christmas week with my husband and two teenage children to the Westin Lagunamar. Not knowing what to expect, this report exceeded all of our expectations. First, owner Brendan Molloy is fabulous. All arrangements were taken care of, he recommended a great service to get to and from the airport (only 10 mintues max) and answered all of my questions asap. This is a time share resort so we had a 2 bedroom lock off affording us 2 bedrooms,2 bathrooms, two washers and dryers, 2 patios as well as a fully stocked kitchen and living room all with an ocean view! The resort provides everything from laundry detergent to great body lotion. The service all around was great. The bar at the main pool is amazing and we often ate lunch here while sitting in the water. The pool rule is if you leave your chairs for 45 mintues (and they do hang tags with times) you lose them....so we hit the beach. With the view of the bluest water I have seen, I returned to the pool to swim and eat but loved the beach. The guys working at the pool were great on the days we did sit there. The gym was small but ample and I never waited for equipment. AND there is Starbucks in the on site store! The resort is peaceful and never felt crowded. I had heard the hotel zone was hectic but we never felt this at all. We walked to restaurants every night but ate breakfast and snacks in the unit. I felt like I was a home as everything was so comfortable and easy. The people staying at the resort were very nice and friendly to boot! This resort is a great value as you get all of the amenities of home, is across from the La Isla mall where we did eat one night but went for ice cream most and it never had a line anywhere. We typically went to all inclusives and were tired of so-so food and lines for everything! This is the opposite in every way. I did hear the spa was great for massages but the week went so fast, I never got to try it. Next time for sure. Thank you Brendan as we cannot wait to return! Great location and resort. Rooms are extremely well maintained and feel spacious (we got 2 bedroom option for 4 people). Very safe and convenient location. Could walk to one grocery store and take a bus to town for other items. Room views as pictured--oceanfront resort with partially obstructed ocean views. This property is great. Two adults and three children ages 2, 7, and 9, spent a week and had a wonderful time. Service is excellent, facilities are modern, beach access is excellent, and the pools cannot be beat. The property is centrally located in the hotel zone with easy access to restaurants and activities. The owner of this property is responsive and a pleasure to do business with. Highly recommended for families. I'm so glad you had a good vacation! Thank you for the fantastic comments! We had no problems all week. Rates are subject to change until confirmed. Nightly rates shown are correct for Thursday through Sunday. Contact me for a price on stays of less than a week. 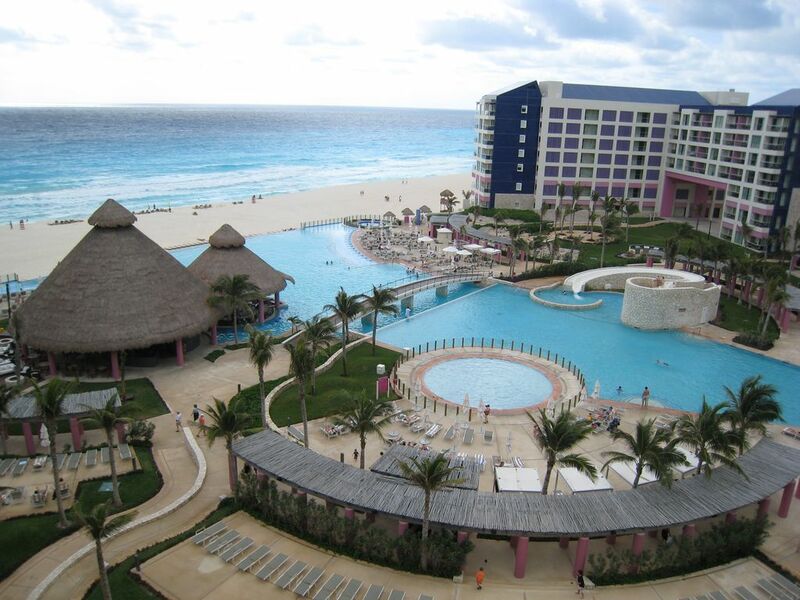 The resort charges a hotel tax that is mandated by the Mexican government of roughly $5.96 per day. That is collected when you check-out and not included in the rental. The resort requires a credit card upon check-in for incidentals.